GenScript's single chain variable fragment (ScFv) generation service includes fully custom ScFv generation in both mouse and rabbit. 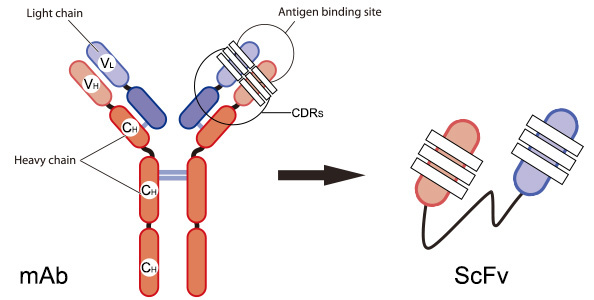 The service itself combines GenScript's highly trusted hybridoma technology with our top notch antibody sequencing and recombinant antibody expression platforms to generate high specificity ScFvs. 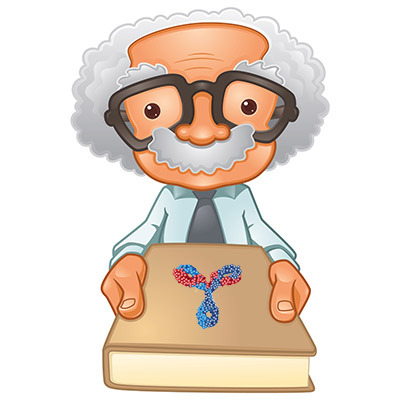 Our ScFv generation service also includes immunization with a variety of antigens as well as multiple delivery options to ensure high quality performance in any and all applications! Interested in Learning More About ScFvs? What is a Single Chain Variable Fragment? A Single Chain Variable Fragment (ScFv) is composed of a heavy (VH) and light (VL) variable region from one antibody chain which are linked together through a 15-20 amino acid linker peptide. Each subunit of the ScFv (VH & VL) contains 3 hypervariable complementary determining regions (CDRs) which are responsible for antigen binding. Therefore, ScFvs are considered to be the smallest unit of an IgG molecule to have full antigen binding activity, as they are only about 25 kDa. What are the Benefits of Using ScFvs? What Are the Applications of ScFv’s? ScFv's have recently been recognized for their superior use in a wide range of applications due to their beneficial attributes. The small size of ScFvs enables genetic manipulations to conjugate them with radionuclei, quantum dots, nanoparticles, ect. Thus, they can provide a non-invasive tool to visualize the location and distribution of specific targets in vitro. The rapid clearance of ScFc's without loss of affinity makes them ideal for radio-based imagery in which it can be detrimental to expose a tissue to radio-waves for too long. ScFv's labeled with fluorescent dye allow for easy visualization of in vivo targets which would difficult for full length mAb's to reach. The specific target recognition of ScFvs combined with high levels of expression via viruses make them useful tools to deliver drugs, siRNA, and toxins to immune cells and tumors. ScFv's have been genetically added to the coat of viral and non-viral expression systems in order to allow for targeted drug delivery. The ScFv is expressed in order for the expression system to connect to its drug target and deliver whatever drug they hold inside. ScFv's have also been used as immuno-nanoparticles for the delivery of drugs to a specific target, even those that are embedded in other cell types or hidden. CAR-T Based Immunotherapy: ScFv's are expressed on the surface of T cells in order to target them to specific tumor associated antigens and induce an immuno-oncological effect. Metabolic Intervention: Using an ScFv as a means of inhibiting or activating a molecular mechanism. Treatment of Solid Tumors: Immunotherapy using standard mAbs has not been successful for solid tumors due to decreased penetration. ScFv's are able to penetrate these solid tumors to allow for targeted drug delivery or even immunotherapy.